Have you ever felt torn between your head and your heart? Your heart longs for something, but your brain tells you why it’s unreasonable? Or you follow the reasonable path, and your heart pipes up, saying “This isn’t good!” but you don’t know what else to do? Your heart is your connection to Source, your compass to guide you on your path. Listen to your heart and it will never lead you astray. Your brain is designed to be a problem-solving machine. Give your brain a problem, let it crunch, and it will come up with a solution. 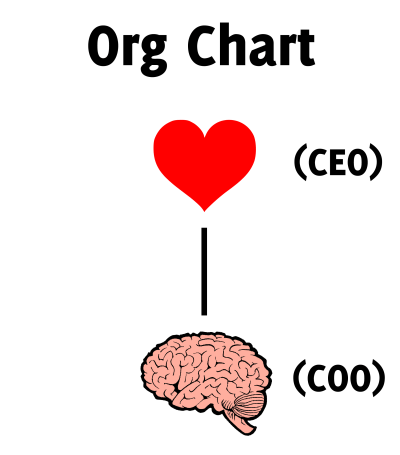 Let your heart be your CEO, and your brain be your COO. The CEO (Chief Executive Officer) is the one in charge of running things, of making the big decisions. The COO (Chief Operations Officer) is the one in charge of implementing the CEO’s big decisions. The COO is the problem-solver, the strategist. Let your heart be the boss and your head be the office manager. Let your heart be the sovereign and your head be the vice-regent. Let your heart be your guide, and let your brain work out the details. When your problem-solving machine is in charge, everything starts to look like a problem. Life turns into a to-do list. And when everything is a problem to be solved, there’s no room for the wild messiness of the heart. Your brain may demote your heart to janitor and stop listening to it entirely. All the problems are solved efficiently, but where are you going? Where’s the joy? Where’s the fulfillment? It’s locked in the janitorial closet, that’s where. It’s also possible to go too far – to promote your heart to CEO and fire your brain. When you feel the pain of disconnection, of having your heart locked in the janitor’s closet for so long, it’s tempting to cast your brain as the Bad Guy. Firing your brain can lead to feeling centered but weak, spiritual but disengaged from the world. Getting rid of your problem-solving ability disempowers you and limits your effectiveness as a force for good. Living a heart-centered life is a noble goal. But living a heart-only life can be an excuse to hide, to stay small. Ignoring the potential of your brain is like saying, “Okay, I’ll do my best to be of service, Spirit, but I’ll do it with both hands tied behind my back.” How do you think you can truly best be of service: as a mindless robot who only obeys direct orders and never takes initiative? Or as an empowered, intelligent vice-regent who can make smart decisions and take right action? Don’t throw the brain-baby out with the bathwater. Your brain isn’t bad. It only gets out of control when you let it lead your life. Let your heart lead, and let your brain follow. Let your heart be your compass, and let your brain be your survival handbook.